March 23, 2015 marks 20 years that my beloved father passed away. It is extremely sobering to realize that it has been so long since my dad passed from this life into the other. In all these years, not a single day has gone by where I have not remembered something he told me, taught me, or shared with me. My dad was not a man for the “faint of heart”. He would say it as he saw it. This didn’t win him brownie points with the “politically correct”, but at least no one could fault him for lying. I actually respected him enormously for this. He was not about making friends; he was all about truth and honesty. He lived by the words, “the truth shall set you free” (John 8:32). My father was a brilliant man. He dreamed of being an architect. Sadly, opportunity and life circumstances didn’t work to his favor, but it is no doubt thanks to him that I have a deep appreciation for education and learning. He loved mathematics, science, history, geography and politics. He wanted me to become an astronaut. I became an engineer and worked on many a problem related to aerospace. Maybe that was good enough ? He would explain in great detail all kinds of historical events from Antiquity to modern times, with “insider knowledge” as if he had been there. For fun, he would quiz me on world capitals and come up with strange and unusual places that I didn’t even know existed then relish proving their existence on a world map, telling me all about their culture and history. He was also an amazing visionary, foreseeing historical events well before they ever occurred. When I was a kid in the late 60’s, he would talk about what a mistake going to Vietnam was. Some considered him “anti-American” for speaking such “commie pinko” blasphemy at the time, and yet years later, history would show that the Vietnam war was a terrible failure costing over 200,000 dead or wounded Americans . In the late 70’s and early 80’s, I would tell him that I was afraid that Russia would “nuke us”. He would say, “Hell no! They won’t nuke us. For as long as Russia is our enemy, they are our friends. They provide us with jobs and a strong economy.” Years later, following the fall of communism, the world has experienced the good and the bad of globalization  and has known economic turmoil, the likes of which had not been seen since the great depression . In the early 90’s, when the U.S. first went into Iraq, my father was already very ill suffering from congestive heart failure, he told me that Saddam Hussein didn’t have weapons of mass destruction, that it was all an excuse to go in for oil, he also told me that U.S. intervention would lead to complete chaos in the Middle East. Years later after his death, the whole world learned that Iraq didn’t have weapons of mass destruction . What’s more, we learned the effects of meddling in the Middle East and have unwittingly contributed to the rise of extremism  with which we will suffer for years to come. My father’s religious views were non-traditional and surprisingly progressive . He believed that God created the heavens and the earth, allowing for “divine evolution” to take over such that God didn’t interfere in foolish human affairs thereafter. Although he was brought up Christian, he looked upon Christ and his disciples as a group of rebellious anti-Roman rabble rousers, wanting to dispel their homeland of foreign occupation. Despite this more “historical view” of Christ, he appreciated Christian doctrine, believing above all that we should “do unto others as you would have them do unto you” (Luke 6:31). As I look back on the past twenty years that my father has been gone, I reflect upon my “more traditional” religious views. I think upon the idea that Christ came to this earth to be born like us, to live like us, to know death like us, and to teach us about everlasting life. Christ was shunned by many of his peers and crucified as a traitor, experiencing one of the the most horrible forms of torture ever invented by mankind . Moreover, just like us, Jesus sometimes felt abandoned by God. At about three o’clock, Jesus called out with a loud voice, “Eli, Eli, lema sabachthani?” which means “My God, my God, why have you abandoned me?”( Matthew 27:46) Just like us, Jesus had to acknowledge that certain things were out of his own control and in the hands of God. Jesus said, “Tetelestai”, meaning “It is finished” (John 19:30). In his last words, he teaches us to give ourselves up to God’s will. And speaking in a loud voice, Jesus said, “Father, into your hands I commit my spirit” (Luke 23:46). His death and resurrection teach us that death is but a passage into eternal life. This is what we are taught to believe as Christians. The choice is ours to and ours alone to believe or to reject. In the beginning, when I first learned about my father’s illness, I prayed to God to heal him, but after seeing him suffer for 7 long years, and knowing that his end was near, I prayed for God to take him. When my father passed from this world to the next, I thanked God for taking him and prayed that he’d give him a small space in his kingdom of heaven. 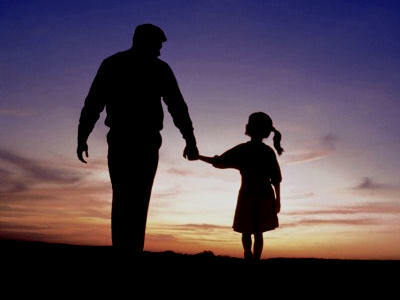 My faith teaches me that one day, my father and I will be reunited. It also teaches me that no matter what life throws at us, we should do everything in our power to remember the words “Thy will be done”. May God keep you close to him in his Kingdom of Heaven, Daddy, until the day that we shall be together again. Amen.